Miranda in Milan isn’t so much a retelling than a sequel, reimagining of the events after The Tempest by William Shakespeare, picking up the tale at the play’s end where everyone including the magician Prospero and his daughter Miranda are getting ready to head back to Naples. But instead, they end up in Milan. Miranda and Ferdinand are to be married in celebration of their triumphant return, and Prospero himself is to reclaim his dukedom. Rather than the joy she expected, however, Miranda is met with fear and distrust at her destination, shunned and shut away in her chambers at the castle. Whispers of Miranda’s resemblance to her dead mother Beatrice follow her everywhere, and she is forced to wear a veil to hide her face whenever she ventures outside. Isolated and friendless, abandoned by her father who has gone on to do bigger things and with no word when her wedding will happen, Miranda begins to lose hope. That is until she meets her new maid Dorothea. As a Moor, Dorothea is just as ostracized as Miranda, and she doesn’t seem bothered by the rumors about the duke’s daughter. The two of them start to grow close, with the friendship swiftly blossoming to become something even more. Meanwhile, it appears Prospero has not been entirely truthful in his proclamations to abandon his magic. As everything begins to fall under the threat of his dark schemes, Miranda and Dorothea must work together to uncover the truth and save Milan. In the original play The Tempest, Prospero is the main character, portrayed as an unfortunate exile. Miranda is but a mere side note, her actions and behavior completely dictated by her father. In Miranda in Milan, however, it is she who gets to feature as the story’s protagonist, while Prospero is cast as its villain. Admittedly, I might have been more taken with author Katharine Duckett’s direction of these roles had I not read 2017’s Miranda and Caliban by Jacqueline Carey. While there are many differences between the two books, at their heart, both shine the spotlight on Prospero’s kind and compassionate daughter, both reimagine her in a coming-of-age romance, and both depict her father as a domineering and menacing figure in her life. There are just enough parallels to invoke comparisons between how the characters, relationships and themes are handled, and in almost every way—e.g. character development, romance, world-building, storytelling, etc.—I felt Miranda in Milan fell short. Part of the issue could be due to its length. At just a sliver over 200 pages, this novella had a lot to convey and yet not enough time to do it. I hate to say it, but this is why I’m typically wary of short fiction because more often than not, I come away from short works wishing they had been more, and this was one of those cases. To wit, there’s a lot going on in this book: first, the Shakespearean elements, and contextual details of the original play that had to included; second, there were the relationships—and that means not only of the romance between Miranda and Dorothea, but also the complexities and nuances in the dynamics between Miranda and Prospero, Miranda and Ferdinand, etc. ; and third was the overall plot itself, which sought to incorporate a bit of mystery related to Miranda’s mother along with the intrigue and conspiracy of Prospero’s dastardly plans. With all this in play, there was barely enough time to properly explore the world’s secrets or its magic, or go any deeper into characters’ backgrounds, personalities, and motivations. As a result of this, I have mixed feelings. On the one hand, I want to praise this book for its ambitions and its integration of so many interesting and rich concepts, but on the other, I can’t say it managed to develop any of them very well. This ineffectual build-up ultimately led to very little pay payoff and satisfaction, sad to say. For example, Miranda and Dorothea’s romance—which I considered to be the most notable aspect of this tale and thus expected quite a lot from—ended up being nice and sweet but also rather superficial and uninspired. As well, the ending which I thought contained several unique twists and revelations was nonetheless anticlimactic simply because the story’s foundations were not developed enough to make me feel much of anything for the characters or their conflicts. Miranda in Milan being Duckett’s debut, I also wasn’t surprised to run into pacing problems. Understandably, some things cannot be rushed, but I did feel the early sections of this book moved too slowly and were bogged down by unnecessary diversions. All in all, I can’t say I loved this book, but that being said, I didn’t dislike it either. In the end, I think I just wanted more—more depth, more clarity, more detail. More feeling. 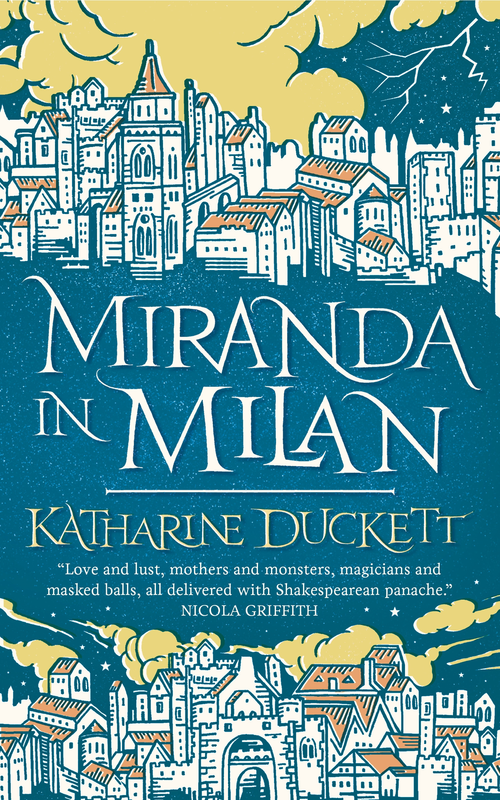 It’s possible that tighter pacing and more pages could have provided all that, but as it is, Miranda in Milan gets an average rating from me, though I will keep watching to see what Katharine Duckett writes next. I’m not a fan of retellings, but I was really interested in checking out reviews of this one. Bummer it didn’t have the depth you were hoping for. Yeah, it’s a shame. I think it would have benefited from being longer. It’s not one of my favorites by Shakespeare, so admittedly I don’t know it as well either. You took the words right out of my mouth–er, fingers. It was such a disappointingly “eh” experience for me. And I definitely wish it’d been longer. I don’t think any kind of retelling/pseudo-sequel of Shakespeare’s work could be done properly under 300 pages. When you put it that way you are 100% correct! Trying to tackle Shakespeare is an ambitious undertaking, you really gotta be all in. At least you found some redeeming qualities about the book. I have been seeing it around but after reading your review, think there are other books I’d rather pick up. Sorry it didn’t work out a tad better for you. Yeah, I probably wouldn’t prioritize it, though on the positive side, it’s a short book and a relatively quick read. Hmmm, I’ve been wondering whether this would be worth a read or not. I’m not totally sold on the novella format either, I do like my worlds and characters to be fully fleshed out. I liked the idea of Miranda getting her own story, so maybe Jacqueline Carey’s book is where I’ll head instead. This is a book that I really liked the look of, well, who am I kidding – I loved the cover – plus, the Tempest. But, novellas can be very hit and miss for me so this one is probably going to be one that I’ll leave be. The cover is gorgeous, I agree! And I’m the same way when it comes to novellas. I don’t think I’ve come across any of Shakespeare’s work with so many retellings and offshoots! Add to the Carey one, Caliban’s Hour by Tad Williams (forgettable), and what sounds similar to this, Coral Bones by Foz Meadows, which I liked a lot. Yeah, it definitely feels like I’m seeing a lot more Tempest retellings lately!